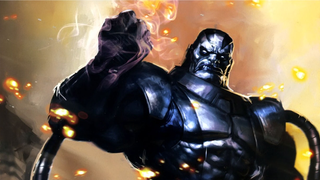 X-Men Apocalypse has been pretty open in sharing behind the scenes goodies during filming, but we’ve seen nothing of the movie’s villain, the titular Apocalypse—that is, until now, thanks to a new poster being given out at Comic-Con. IGN have gotten their hands on a poster being doled out at Comic-Con, and although it’s not an actual photo of Oscar Isaac in character as En Sabah Nur (a.k.a. Apocalypse), it’s a pretty good look at how the movie is translating the design. Looks like the poor Xavier Institute will be tasting Apocalypse’s wrath in the movie, judging by those ruins. Oh dear. No doubt we’ll be seeing more from X-Men: Apocalypse at Fox’s panel for its upcoming movies, but for now, what do you think of Apocalypse’s take on, err, Apocalypse?